Has anyone found a good use for her? It seems that she is really just for shutting down potential jumper characters or mid-story spells if an opponent has 1 domain left open, which the opponent can easily work around. I have never been really compelled to use her either. Most of the time if I am including a 3 cost neutral card it is good old Marcus Jamburg (WoP). ). She brings Investigation and can keep away Black Dog (WoP)andMaster of the Myths (IT) by draining the domain and hinder the opponent defending a story. But because of the 3cost she comes into play a bit late..(depending on opponents deck). In general I like to play this character. The best time to play all events is just after opponent commits, so she can limit that quite well. All those events where you react to what opponent does and hit the weakest link. I don't see how to work around it other than not playing those cards or not using domains, both options mean she's done her job. Also there are many effects/events you want to fire in opponents turn, but need to pay drain cost. If opponent has her in play committing to stories and playing events in opponents turn becomes so much harder. and some other cards in his deck if i recall correctly. it might be some really irritating domain choke. But cost 3 is quite high, not sure its worth it without other synergies. And there are so many good cards to fight for the spot. Chosen for CotD 5th July 2015, as being able to force domains to be drained on your opponent simply by committing to a story means your opponent has to get rid of her (likely drain a domain to do so), use up all their domains so she does nothing, or accept one of their domains will get drained. In addition, her skill and icon spread mean for mythos factions she can add investigation, which is never bad. She cuts down on your opponent's shenanigans quite a bit, seems worthwhile to me. At the casual level, maybe not, as there probably aren't as many shenanigans going on in the game, but at the competitive level it happens a lot. I like her, but never really got to playtest her extensively. 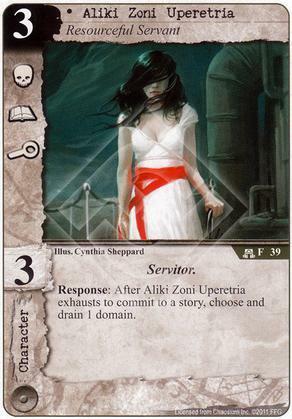 I once put her in a Silver Twilight/Miskatonic deck built around Itinerant Scholar, whom I like quite a bit.